(Lanka e News -11.Aug.2018, 11.45PM) It is a well and widely known fact some years ago it is robed rowdy rascally monk Galagodaathe AnGnanassara the two legged brute who stormed into a women’s maternity clinic in Piliyandala area to violently threaten and stop the birth control tasks carried out in that clinic. This is the same robed rowdy monk who also stormed into the Homagama court to teach the laws he learnt when he was engaged in picking up cinnamon remnants – his previous occupation before wearing the sacred robe and profaning it. It is a strange coincidence , the laws he was disdaining and disparaging within courts by saying ‘I will not accept the laws of the Suddhas (the British) ’ ,and ‘ effeminate lawyers of the state’ are the very laws under which he was recently sentenced to 19 years rigorous imprisonment (RI) to be served in six years. 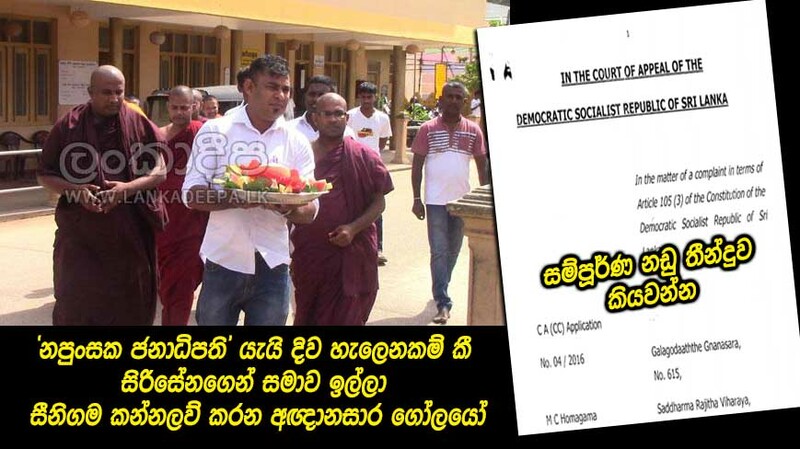 Strangely , it is the secretary of Gnanassara’s Bodhu Bala Sena , Dilantha Vithanage the despicable moron who made the most stupid utterances…. While nowhere in the world cameras are allowed to be installed during a court trial , this stupid idiot the self proclaimed IT expert Dilantha said , what the court should do is install cameras in the courts.. He also pointed out like the president’s executive power is trimmed , the powers of the judiciary should also be curtailed. In other words , what this Dilantha is demanding is a judiciary which is not independent and sovereign , meaning that the society shall be lawless. So , the request of this Dilantha the ‘molkantha’(lunatic) is , when a court trial is in progress , other robed scoundrels like Gnanassara too should be allowed to storm into the center of courts and insult the judiciary. If only Dilantha had a tail , cattle thieves would rob and make a sumptuous meal of him. The time has arrived for Dilantha the Molkantha to learn kindergarten lessons at least from his daughter. The historic court verdict which curbed and controlled the barbarism and hooliganism of AnGnanassara who was picking cinnamon remnants in Galagoda at one time , and his other rowdies draped in yellow robes is hereunder ….